Published: Oct. 16, 2018 at 04:36 p.m. Along with the colorful and creative, week 6 brings us cleats for cancer awareness and NFL's Crucial Catch initiative. A detail view of a player's Crucial Catch cleats prior to an NFL football game between the Jacksonville Jaguars and the Dallas Cowboys, Sunday, Oct. 14, 2018 in Arlington, Texas. Dallas Cowboys running back Ezekiel Elliott (21) kneels in the end zone before the first half of an NFL football game against the Jacksonville Jaguars in Arlington, Texas, Sunday, Oct. 14, 2018. A Kansas City Chiefs player wears a decorative Nike game shoe during the first half of an NFL football game between the Chiefs and the New England Patriots, Sunday, Oct. 14, 2018, in Foxborough, Mass. View of Crucial Catch cleats worn by Tennessee Titans linebacker Jayon Brown (55) as he stretches before a game against the Baltimore Ravens at Nissan Stadium. A view of the custom Crucial Catch Adidas cleats worn by cornerback William Jackson (22) during the game of the Pittsburgh Steelers against the Cincinnati Bengals at Paul Brown Stadium. A detail look of a player's Crucial Catch cleats prior to an NFL football game between the Pittsburgh Steelers and the Cincinnati Bengals, Sunday, Oct. 14, 2018 in Cincinnati. 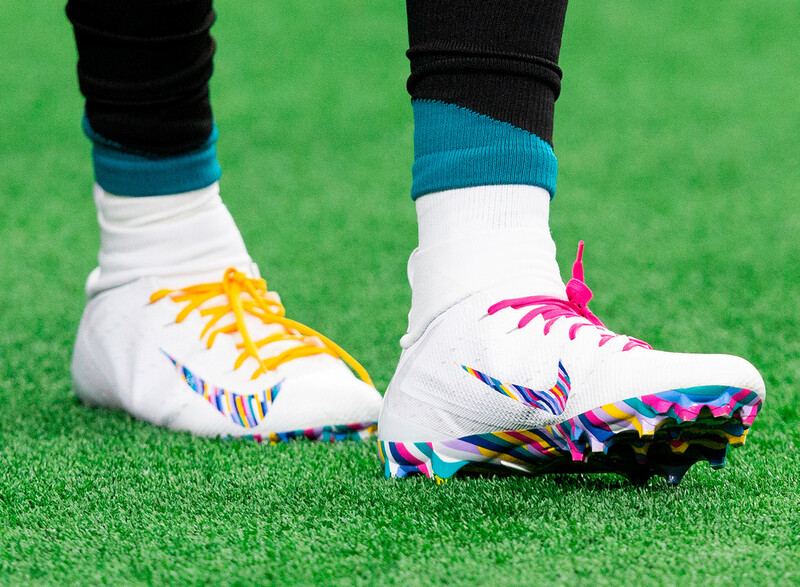 A detail view of a player's pink cleats prior to an NFL football game between the Jacksonville Jaguars and the Dallas Cowboys, Sunday, Oct. 14, 2018 in Arlington, Texas. Cleveland Browns wide receiver Jarvis Landry's cleats before an NFL football game against the Los Angeles Chargers, Sunday, Oct. 14, 2018, in Cleveland.